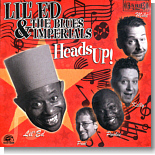 "Ed Heads," the rabid following of blues fans attracted by Chicago band Lil' Ed & the Blues Imperials, will be delighted with their favorite band's latest album for Alligator. It's this month's Pick Hit. New Orleans guitarist Bryan Lee teamed up with Duke Robillard and a bunch of his New England blues pals to make the fun jump and swing CD Six String Therapy. It's this month's Surprise pick. Our chief reviewer has never hidden his affection the music of The Holmes Brothers. Their stunning new "greatest hits" collection on Rounder Records, Righteous!, is this month's Flashback. This month's What's New section includes new releases from Delbert McClinton, Roy Roberts, Gary Moore, Jimmy Thackery & Tab Benoit, David Johansen & The Harry Smiths, a reissue from Walter Trout, and the special four-CD anthology, When The Sun Goes Down.